Temple of the Dog was sort of a reverse super group in the sense that the group members would go on to play in two of the more successful rock bands of the 1990s. However, at the time of this group’s short recording career in 1990, none of its members had yet achieved any great fame or recognition as they would in Soundgarden and Pearl Jam in subsequent years. In any case, the 1991 eponymous is an exceptional musical statement which far surpasses the trivial curiosity it was portrayed as throughout the early nineties. In March 1990, Mother Love Bone front man Andrew Wood died of a heroin overdose. Wood’s former roommate and Soundgarden lead vocalist Chris Cornell approached two former members of Mother Love Bone, guitarist Stone Gossard and bassist Jeff Ament about recording some material he had previously worked on with Wood. At the time, Gossard and Ament were in the early phases of the group who would become Pearl jam and they invited another group member, lead guitarist Mike McCready to join the Temple of the Dog. In turn, Cornell enlisted Soundgarden drummer Matt Cameron to round out the quartet. 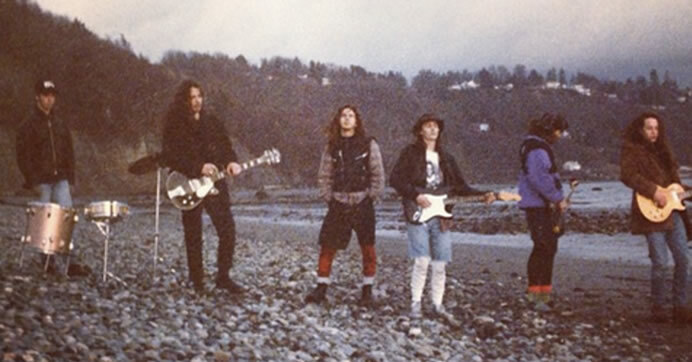 Temple of the Dog was recorded in Seattle in just 15 days with producer Rick Parashar, who also provided some keyboards on select tracks. With few expectations from the record label, the musicians were free to record as they saw fit and they accomplished great synergy over that short time period. The name of the group and album was taken from the Mother Love Bone song “Man of Golden Words”. Cornell wrote all the lyrics as well as most of the music on this album. Uniquely, the album begins with its two longest tracks, both of which were written in direct response to Wood’s death. “Say Hello 2 Heaven” starts with a solo, picked electric guitar before the strummed rhythms come in for the verses. This opener features a soulful and dynamic melody with fine backing harmonies during the chorus, which helped drive the song to the Top 5 of the Billboard Mainstream Rock Tracks chart. “Reach Down” starts with a doomy and droning electric guitar riff above slow rhythms through the verse sections. Giving this eleven minute track much of its mass the extended duo guitar lead by McCready and Gossard, while the predominant lyrical theme is “reach down and lift up the audience”. The most popular song on the album, “Hunger Strike”, may be its simplest. Three chords are built upon with stronger arrangement and vocals building the track’s intensity. Pearl Jam vocalist Eddie Vedder performs co-lead vocals with Cornell as Vedder stepped in when Cornell was having trouble with the vocals during a duo band rehearsal. The result was a worldwide hit in 1992. “Pushin Forward Back” is a bass driven riff track, written by Ament and Gossard as an odd-timed riff drone jam. Like many many tracks on this album, this acts as a canvas for Cornell’s fine vocals. Presented as a standard ballad, complete with minor-key piano by Parashar, “Call Me a Dog” is a vocal driven, sad ballad which manages to never become mushy or boring. “Times of Trouble” is another crooning ballad but with slightly more grunge rock elements including soaring vocal melodies through choruses and a later slight harmonica lead by Cornell. “Wooden Jesus” is built on a revolving drum beat by Cameron with some strategically added percussion for extra effect in the intro. Later comes an interesting little banjo during second verse and great wah-wah guitar lead during the bridge. “Your Savior” features funky beats and grooves throughout with more good drumming, leading to “Four Walled World”, a slow, cool jam based tune co-written by Gossard. The sparse guitar chords and fretless bass help to make this a fine track sonically as do the later dual slide guitars add the next logical element to the effect. The closer “All Night Thing” features a sparse arrangement with shuffling brush drums accompanied by Hammond organ with the lead vocals pretty much carrying the dynamics. Clever and accessible, this album closer sounds like it could have been a big hit. 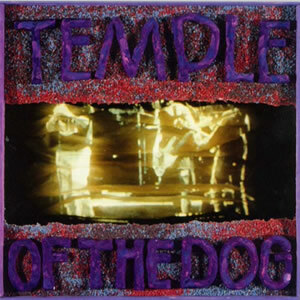 Temple of the Dog sold poorly upon its initial release in April 1991, but it found new life a year later after Soundgarden’s Badmotorfinger and Pearl Jam’s Ten found great success in late 1991. Eventually, the album sold was certified platinum and went on to become one of the more highly regarded releases of the decade.